It's time for another Christmas card for the Christmas Card Club - actually it's way past time, but as I said the other day I was visiting my sister and so had to make and post this now. This time the theme is stars and was chosen by Mrs A. A very simple card this time. 5" x 7" base card, matted with turqouise card from stash. The starry background is a freebie digi paper which I have had for some years. I have a feeling it is from Bearly Mine but I can't be certain. I computer generated the verse and die cut it with Spellbinders Oval Bliss. The large star is a Signature dies and the smaller ones Memory Box Cosmic Star Set cut from self adhesive silver glitter film which I found at the back of a drawer. I have no idea how long I have had it. 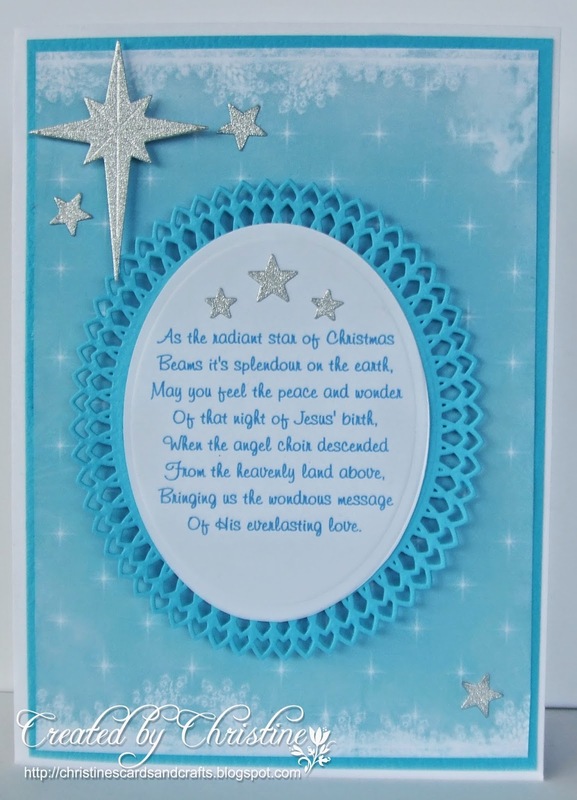 The verse is a favourite of mine and I use it a lot for my Christmas cards. I just love your beautiful card. The colours, central sentiment and all over design. This is gorgeous, such a beautiful design and I love the colours. This is right up my street, elegant and classy, love it. Lovely card. I love the verse. Love your CAS christmas card Christine! Gorgeous! What a beautiful verse too Christine and I love that SB oval die that you have to frame it. Christine this is really gorgeous. Very classy card. I love your card and your star is perfect. sorry I haven't managed to comment until now. My lack of internet is driving me slowly round the bend. six weeks and they still can't get to the bottom of it and get it fixed. I get 5 mins at a time if lucky. going to save and exit this before I loose contact. hugs Mrs A. How did I miss this beautiful card? Love that star die you used here. It is stunning.